Time is rapidly running out for Jubilee students to increase their strength and stamina over 81/2 and 9 1/2 miles. Expedition 5 therefore takes us from Burrator Inn at Dousland, round the reservoir and back again. This time accompanied by Ms Unwin, Ms Owen and Ms Nettle (Mrs Guest being in Cuba!!). Lovely to see Ms Nettle again, who is familiar to all of our walkers and who herself is only recently returned from a trip to Iceland, (where she purchased enough for a dinner party, only kidding). She did get to see the Northern Lights. Thank you to Phil, manager at Burrator Inn who allowed us to park safely at his site. Although we started walking in rain and hail, gradually the weather picked up as the miles passed. So much so in fact, we ended walking in tee shirts. Students were very sensible and negotiated the many pauses to allow cars and tractors to pass. Traffic also included cyclists, runners , walkers, ponies, dogs and push chairs as the reservoir is a magnet for anyone wanting to be out and about, including one of our parents training for the London Marathon! The students stopped for drinks and snacks throughout and thus were able to keep going. Nicole in particular found the distance hard work towards the end and Dylan picked up a large blister in spite of wearing 2 pairs of socks. Never the less they both pushed on and completed their walk, along with Sam and Emily. An ice cream helped of course. Big thank you to Ms Owen and Ms Nettle who ensured the walk was enjoyable and successful. 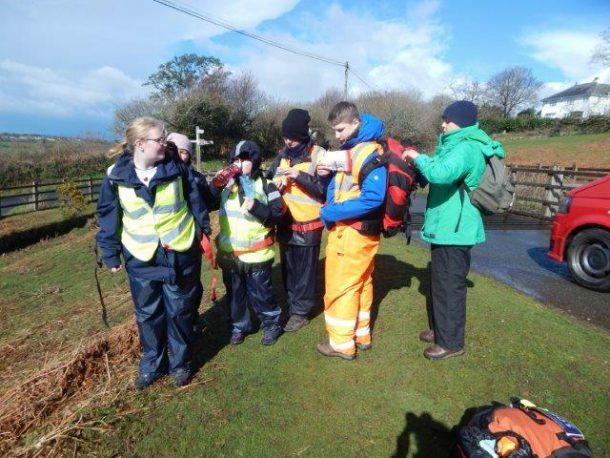 One more to go on March 31st– Yelverton and Clearbrook.